Fans of Lucio Fulci were well aware of the original The Beyond in 1981 (L'Aldila), long before its theatrical re-release in 1998. Arguably the film most representative of the director's work and style, for years it was butchered and available only under the title Seven Doors of Death. The Beyond, one of the great gorefests, is a movie you either love or hate. While the story and visuals might be all over the place, Fulci's intentions were simple. "What I wanted to get across with that film was the idea that all of life is often really a terrible nightmare and that our only refuge is to remain in this world, but outside time," he once said. Often considered a sequel of sorts to City of the Living Dead, Fulci shot the picture on location in New Orleans. Catriona (Katherine) MacColl, one of Fulci's favorite actresses and star of Living Dead, was on hand for the ride. A flashback takes us to Louisiana in 1927, where a lynch mob approaches an old hotel. With torches and chains in hand, the men enter the hotel and search for the manager, a painter named Sweick (Antoine Saint-John) - whom they believe is guarding the gateway to hell. "You ungodly warlock," the mob's leader tells him, as he viciously beats him with a chain..."because of you, this hotel and this town, will be cursed forever!" Sweick begs for his life and says the hotel was built over one of the seven doors of evil...and only he can save them. The men continue to beat him, ripping his skin off with their chains. Using huge, rusty nails - they crucify him to the wall and then dump boiling lava on him. A young girl reads from the Book of Eibon, which says in part: "In this book, I collected all the prophecies of Eibon, handed down from generation to generation over more than 4,000 years. "...The seven dreaded gateways are concealed in seven cursed places (by ayotunde at dresshead online). Woe be unto him who ventures near without knowledge. Woe be unto him who opens one of the seven gateways to hell, because through that gateway, evil will invade the world..."
It's now 1981 and Liza Merrill (Katherine MacColl) has just inherited the Seven Doors Hotel and relocated from New York City. Her architect friend Martin (Michele Mirabella) wants to completely renovate the place. But for now, Liza plans only to have the outside walls painted and to "tidy up inside." Larry (Anthony Flees), one of the painters, falls off a scaffolding after catching a glimpse of a girl in one of the rooms. The accident causes severe bleeding and all he can do is mutter about the girl's strange eyes. Liza tells her assistant Arthur (Gianpaolo Saccarola) to call for a doctor. Dr. John McCabe (David Warbeck) arrives and immediately sees that Larry desperately needs medical attention. He takes him to a hospital right away. Martin wonders how a man could fall off a scaffolding that is six feet wide. After finding the painting that Sweick was working on when he was murdered, Martin and Liza are baffled by the bell going off from Room 36 - since there aren't any clients yet. Joe the Plumber (Giovanni De Nava) shows up and Liza tells him that no water is coming out of the faucets...but the basement is flooded. She shows him where the cellar is and they find Arthur's mother Martha (Veronica Lazar), who will be a maid at the hotel. Liza asks about her son's whereabouts and tells her she'll be going into town later - and also that she should let her know if they need anything. Liza sees Arthur in her bedroom, looking for keys to the other rooms so he can clean them. She seems bothered by his presence and sends him up to the roof to check the chimney. Joe finds that the water is coming from behind a brick wall, which he knocks down. On the other side, he discovers a secret room. He wanders around and notices one of the walls crumbling. Suddenly, a hand reaches out through a hole and gouges the plumber's eyes out. While driving to town, Liza stops the car when she sees a blind woman (Sarah Keller) and her seeing-eye dog in the middle of the road. It's the woman with the white eyes that Larry saw back at the hotel (and she seems to resemble the person who found Sweick's book decades before). Her name is Emily and she knows who Liza is, saying she's been looking for her. The woman...along with her dog Dicky...leads Liza to a huge mansion she lives in. Inside, she plays a piano - while telling Liza that she must give up the hotel. Emily won't divulge a reason but says she should trust her. While Liza is driving back home, John's car pulls up alongside her vehicle. Meanwhile, Martha goes down into the basement to look for Joe and hears an odd banging sound. She finds him near death and practically decomposing. Nearby, she sees a body emerging from the water. Both corpses are taken to a morgue for autopsies, which John and Dr. Harris (Al Cliver) are to perform. The bodies are left alone as Joe's wife Mary Ann (Laura De Marchi) is there to identify her late husband. She leaves their daughter Jill (Maria Pia Marsala) waiting outside and enters the autopsy room. After dressing him and putting a strand of rosary beads in the dead man's hands, Mary Ann looks over at the other end of the room and screams. Jill hears her and rushes in to see her mother lying on the floor, with a jar of acid falling on her face. The girl is horrified as Mary Ann's blood, mixed with the acid, starts flooding the room. She tries to escape and is frightened by another corpse, which looks as if it has come to life. Liza enjoys a night out with John and tells him about her life in New York and the many careers that she had in the Big Apple. She admits to almost becoming a fashion designer - before she got the call about an inheritance after the death of a wealthy uncle. John asks her if she might give up the hotel after the two accidents involving her workers...and she responds that she can't because it's her last chance to be a success. The handsome doctor tells her to book a room for him after all the work is done. Liza says she doesn't know when it will be ready and calls Arthur and Martha "more of a hindrance than a help." "They just can't seem to get it together," she adds. She says she can't fire them because they came with the hotel. John receives a phone call from Dr. Harris informing him of the freak occurrence at the hospital. A burial is performed for Joe and Mary Ann at the local cemetery and Emily watches the prayer service. The priest asks God to watch over their daughter Jill. Liza gives the girl her condolences and when Jill walks away, the girl opens her eyes to reveal the same spooky whites that Emily has. That evening, Liza finds Emily in the hotel. "Why didn't you listen to me?" the blind woman asks. She decides to finally tell Liza everything. She says that sixty years ago, everyone in the hotel disappeared and that Sweick had found a key to the seven gateways to hell. As Emily starts to say something about where the house was constructed over, she's distracted by a sound. She says they're not alone and just then, the bell for Room 36 goes off. Emily tells Liza that the room is where Sweik was killed. She warns her not to enter it but Liza says she doesn't believe in ghosts. Emily puts her hands on Sweick's painting and her hands begin to bleed. She screams and runs out of the hotel. Liza can't resist seeing what is in Room 36 and with no key available, she breaks into it. She finds the Book of Eibon and a ghastly sight ï¿½ Sweick's corpse still nailed to one of the walls. She tries to leave the hotel and falls right into John's arms. When they go back to the room, the body is gone. Liza insists she saw something but decides she simply has an active imagination and got carried away after hearing Emily's story. John wonders who Emily is - and when Liza tells him, he says he doesn't know of a blind girl living in the area. To make matters more confusing, the book is suddenly missing. Later in the day, Martin again tries to convince Liza to completely renovate the hotel. She gives him her okay as long as it doesn't cost too much. While walking down a street together, Liza sees the Book of Eibon in a store through the window. When she goes inside to take a closer look, the book has disappeared. Martin goes to the office of the town clerk (Lucio Fulci) to get the hotel's construction plans. He notices something odd about the map and falls off a ladder, cracking his skull on the ground. A group of deadly spiders emerge and descend on his body. (If the fall didn't kill him, the spiders eating away at his face and eyeball certainly did.) The plans mysteriously vanish. John goes to Emily's house to see her but it doesn't looks as if anyone lives there. He uses a pair of shears to break in and finds the Book of Eibon inside, which he takes back to the hospital. In the morgue, he discovers that one of the bodies bears a marking that is inside the book. At the hotel, Martha enters Room 36 to clean it up. The tub in the bathroom is filled with filthy water so she sticks her hand in and pulls out a huge hairball. As the water is draining, Martha sees a zombified body...which then begins emerging from the tub. She attempts to escape but is impaled on one of the rusty nails on the wall. That night, Emily is sitting in the parlor of her house with Dicky. The dog senses a presence. Her piano begins playing by itself and she soon discovers there are zombies surrounding her. Believing that one of them is Sweick, she says, "I don't want to go back. You can't take me!" She cries out that she did what she had been asked to do and sends Dicky on the attack. However, the dog turns on his owner and Emily is mauled to death. Liza looks for Martha and Arthur in the basement of the hotel. Arthur has been hiding and tries to assault her. Liza runs upstairs and is terrified when the bell from Room 36 goes off. John finds her screaming hysterically and does his best to calm her down. She tells him that Arthur tried to grab her, even though he seemed to be dead. John says he's sick of hearing all her stories, including the man nailed to the wall and the blind girl. He tells her that the house Emily supposedly lived in has been abandoned for 50 years. He also says that he found the book she was talking about...but believes that she herself left it behind for him. They go down into the cellar and Arthur is nowhere to be found. John asks Liza who she really is and tells her that the Book of Eibon claims that her hotel is one of the seven gateways of hell. At that moment, an indoor storm breaks out and the water turns into blood. They run to the doctor's car and as the drive off, the light in Room 36 goes on and the undead are soon roaming around the hotel. John and Liza head for the hospital to see Dr. Harris and notice that the streets are deserted. There appears to be no one inside the hospital as well. John goes into his office to get his gun and call the FBI. Liza sees blood on his desk...and suddenly, a glass wall behind her is broken and someone grabs her hair. The place is crawling with zombies and John shoots at them until Liza is freed. He finds Dr. Harris, who tells him he has no idea what is going on. The doctor is killed when a glass door suddenly explodes and he's impaled by shards of glass. Liza tries to hide in the morgue, where she sees Jill sitting on the floor. Unaware that the girl is now part of the undead, she takes her along with them when John tries to lead them out of the hospital. With the corridor blocked, they go back into the morgue...but Sweick's corpse tries to attack them. Jill reveals herself and as she tries to kill Liza, John shoots the top of her head off. They make it down to the basement and realize they're actually underneath the Seven Doors Hotel. Following a mist coming out of a hole in one of the walls, they end up in a strange world in another dimension. Their eyes now fully white, they have crossed over to the other side. "And you will face the Sea of Darkness and all therein that may be explored..."
The looks on the faces of Catriona MacColl and David Warbeck at the end of The Beyond, is unforgettable. Regarding this beautifully realized conclusion, director Lucio Fulci had this to say: "In the end, the two protagonists' eyes turn white and they find themselves in a desert where there's no light, no shade, no wind, no nothing. I believe, despite my being Catholic, that they reached what may people imagine to be the Afterworld." Fulci's gore epic does not disappoint. Whether it's the popping of eyes from their sockets, a little red haired girl with a hole the size of Uganda in her head, a tarantula pack who need anger management...or just a wandering posse of ugly zombies, there's enough here to please all sorts of horror fans. The only way to enjoy this is just to suspend disbelief, sit back and watch with your mouth wide open. The Beyond is simply one of the most interesting and dazzling zombie films ever made...a total gross-out and a classic of its kind. Fulci was not solely responsible for the success of this horror classic. Credit must go to Sergio Salvati for his sure-handed cinematography, Germano Natali for his stunning special effects, and Fabio Frizzi for his soaring Omen-esque score, which perfectly compliments the bizarre visuals and which will make your hair stand on end. 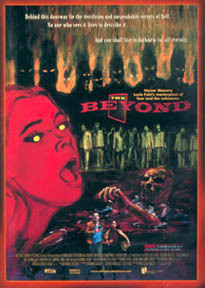 The Beyond had been intended to be one of three films to have told the story of the "seven gateways to hell." Many consider this film, along with City of the Living Dead and House By the Cemetery, to be at least some kind of troika due in part to their zombie themes and the fact that Catriona MacColl starred in all three. Actor David Warbeck himself had begun to write a proper sequel to The Beyond but Fulci succumbed to diabetes-related illness in 1996 and Warbeck died in 1997 at the age of 55, effectively killing any hopes of a true follow-up.